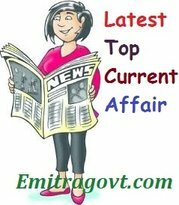 Current Affairs Question 2017: Looking for 30 August Current Affairs? Then start your Quiz right now by answering them. Here in this article, we are giving the Current Affairs Quiz with Questions and Answers. As many people are preparing for various government exams it became mandatory for them to get a grip over the current affairs as in most of the tests are based on Daily Current Affairs. By taking this kind of Current Affairs Quiz candidates can eventually get hold of what they have been working on. Contenders can trust us as we will update all the latest Current Affairs in this quiz. For more such quizzes check our site Emitragovt.com regularly as we will update the Daily Quiz for current affairs. 1. Uber has chosen former Expedia chief Dara Khosrovovshahi as its next Chief Executive Officer (CEO). 2. Iran’s most influential dissident politicians, Ebrahim Yazdi, has died. He was 85. 3. India’s largest telecom operator Bharti Airtel announced a partnership with Symantec Corp to provide cyber security solutions to businesses in India. 4. Barcelona and Argentina star Lionel Messi became the first player to pass 350 goals in La Liga history. 5. Justice Dipak Misra was sworn in as the 45th Chief Justice of India. 6. Mercedes’ British Formula One driver Lewis Hamilton registered his 58th career race win after claiming the Belgian Grand Prix title. 7. Seven Indian companies have made it to the latest Carbon Clean 200 list, which features the world’s largest publicly traded companies making significant revenue from clean energy. The top three Indian companies are Suzlon Energy, Bharat Heavy Electricals, and Tata Chemicals. 8. Dhruv Gargan, Indian-origin boy in the UK, has got the highest possible score of 162 on a Mensa IQ test, placing him in the top one per cent people in the world who achieved this feat. 9. Ahmed Khan, a member of India’s gold winning football team at the first Asian Games in 1951, passed away. He was 91. 10. PV Sindhu settled for silver as she went down to Japan’s Nozomi Okuhara in the women’s singles final of the World Championships in Glasgow.